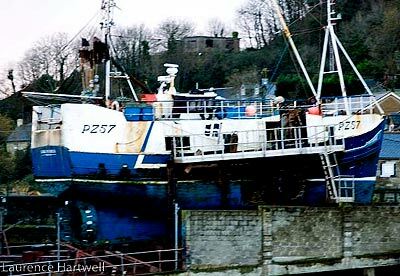 The never-ceasing losses continue: in winds of about force 8 and rough sea conditions, the Mevagissey fishing vessel HEATHER ANNE (FY126) foundered late yesterday evening in Gerran's Bay, about 4 miles to the east of Falmouth. Her two crew were recovered by a sister vessel, the LAUREN KATE (FY836), whose crew raised the alarm and found the men in the sea. A helicopter from RNAS Culdrose took one of the men to Treliske Hospital, Truro where he later died. The other crew member was taken to Mevagissey by one of the two lifeboats from Falmouth that attended the scene but he did not require hospital admission. The HEATHER ANNE was built 40 years ago as the AQUARIUS OF CAWSAND at the respected yard of G Percy Mitchell and Sons in Portmellon, near Mevagissey. Her construction was that of a traditional wooden crabber. 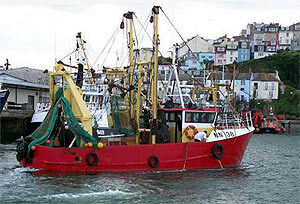 The HEATHER ANNE and LAUREN KATE were both ring netting for Cornish sardines when the tragedy occurred. During a period of extremely strong winds and correspondingly rough seas, at a time when daylight is minimal, the risks faced by mariners have clearly been great. Hurricane force 12 winds were part of the UK Meteorological Office Shipping Forecasts of 8th December. Falmouth Coastguard contributed to a successful international effort to save the crew of the Dominica-registered, Ireland-managed cargo vessel FLORECE. The FLORECE sank after a collision with the AFRODITE at about 03:30 GMT, Friday 9th December 2011, but its Russian, Polish and Ukrainian crew took to liferafts and were safely recovered by the OCEAN TITAN. 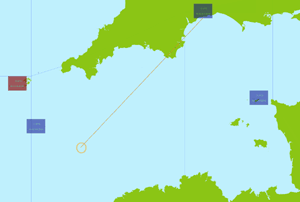 The collision took place in the western Bay of Biscay, about 190 miles SW of Brest, within the UK's Aeronautical Search and Rescue Region. The Press Office of the Maritime and Coastguard Agency has issued a bulletin. Another gale arrived with an Atlantic depression on 26th November and continued overnight. North-westerly force 8 winds (and storm force and above further north) created very rough sea conditions, which resulted in tragedy for some of the crew of a nearly 2,000 ton coastal bulk carrier in the Irish Sea. The 34 year old motor vessel SWANLAND with a Russian crew of 8 succumbed to the stresses and appears to have broken her back. She had a cargo of limestone near her deadweight tonnage of 3,150 tonnes and sank in less than 20 minutes, disappearing from Holyhead Coastguard’s radar. A Mayday call from the captain of the SWANLAND was picked up by HM Coastguard Maritime Rescue Co-ordination Centre (MRCC) at Holyhead about 0200 Sunday 27th November and this began a major search and rescue effort involving multiple sea and air rescue assets from Wales, Ireland, and SW England, together with assistance from commercial vessels. Three commercial vessels, the tankers BRO GAZELLE, MONSOON and KEEWHIT, responded to Holyhead Coastguard’s relay of the Mayday and were integral to the search and rescue efforts, providing windbreak capabilities and light. The initial aerial search was undertaken by a Sea King search and rescue helicopter from 22 Squadron at RAF Valley (Anglesey) and a Sikorsky tasked by the Dublin MRCC. The former aircraft , captain Flt Lt Thomas 'Sticky' Bunn and co-piloted by Flt Lt William Wales (Prince William, Duke of Cambridge), located survivors at about 4am after a pattern search and winched two of the SWANLAND’s crew (including the second officer) from an inflatable liferaft in the Irish Sea about 13 miles north-west of Bardsey Island and about 28 miles south-west of Holyhead The two survivors, Roman Savin and Vitaly Kornenko, gave details of the contact with a particularly large wave that resulted in cracking of the hull and a rapid influx of water. 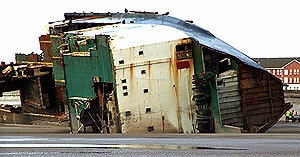 The crew abandoned ship soon after and the bulk carrier sank rapidly. Savin and Kornenko were taken to Bangor Hospital but needed no treatment. 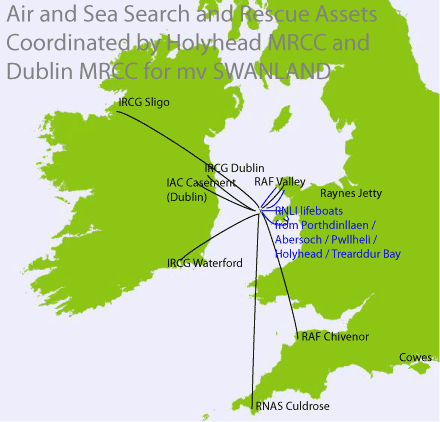 The search work was supplemented by search and rescue helicopters, including those from the Irish coastguard at Dublin, Waterford and Sligo, from RNAS Culdrose in Cornwall, from RAF Chivenor in North Devon, and an Irish Air Corps aircraft from Casement military airbase SW of Dublin. RNLI lifeboats from Porthdinllaen, Pwllheli, and Abersoch on the Lleyn (Llyn) peninsula and from Trearddur Bay and Holyhead on Anglesey responded and the Irish Navy offshore patrol vessel LE ROISIN also proceeded to the search area. A third crew member, Leonid Safonov, was later recovered from the sea by the Rescue-117 Sikorsky from Waterford but he could not be resuscitated. A further five crew were still missing as darkness fell again in the early evening of 27th November and the search was suspended between 1645 Sunday and 0730 Monday. Rescue efforts were hampered by the darkness of the night, the gale and very rough seas. Wind conditions abated somewhat during the search efforts but were expected to pick up again. The limestone cargo had come from the Cemex-owned Raynes Quarry at Llysfaen, near Colwyn Bay and was loaded from the adjacent jetty. The Irish Sea is about 85m deep in the area where the SWANLAND sank, and this stretch of sea has been the scene of very many shipwrecks. On the 20th August 2010, the non-IACS mv SWANLAND (with a cargo of stone for London) was taken in tow by the MCGA’s vessel ANGLIAN PRINCESS after her engines failed while 4nm SW of Lizard Point (Cornwall) and, in force 5-6 SW winds and fairly rough seas, was in danger of being wrecked. Owner location : Melton Mowbray, Leics. 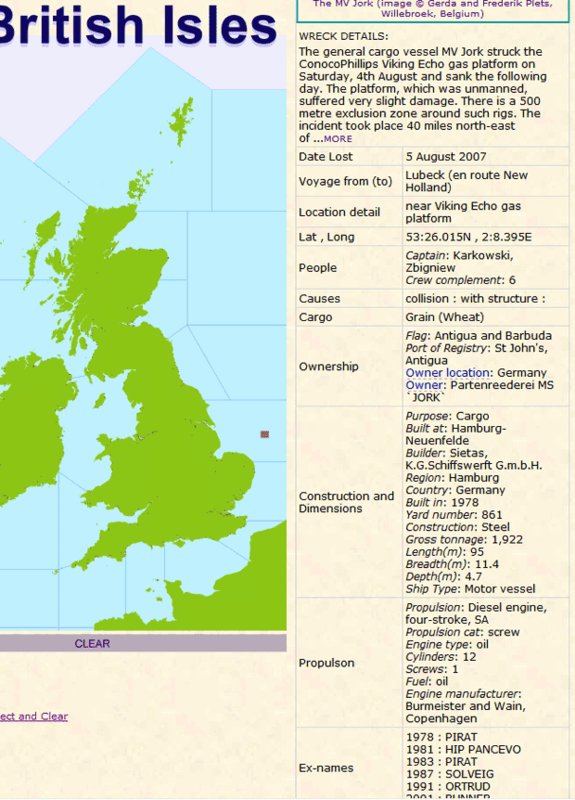 The Dublin-registered vivier-potter, AINMIRE, from Burtonport (Donegal) sank at about 11am on 30th April 2010. It is believed that water had begun to flood into the vessel as a result of a flange malfunction; the pumps were unable to cope with the ingress, and she issued a Mayday call at 0530. The Ullapool fishing vessel OUR HAZEL responded in less than 15 minutes, taking off the crew and standing by until the AINMIRE sank, when she took the crew to Ullapool. Stornoway Coastguard’s Rescue 100 Sikorsky s92 and the Stornoway Severn lifeboat `Tom Sanderson` also responded. The benign weather and sea conditions (SW 3-4, sea state good) and the response of OUR HAZEL and the rescue services ensured the safety of the crew of 5: in the exposed seas north and west of Lewis, where the AINMIRE normally lays her pots near the edge of the continental shelf, the situation can often be much more serious. The crew were wearing survival suits and lifejackets and were all unhurt. An 18.3m, 127 ton steel vessel, the AINMIRE (D536) was launched at the Den Helder (Netherlands) shipyard of Scheepswerf Visser in March 1993. She was owned and skippered by Ross Classon of Portnoo, Donegal. In the winter of 2004 the author and journalist Adam Nicolson spent time with Ross Classon and his Latvian crew on the AINMIRE and wrote an evocative article - describing operations in seas that were definitely not benign - for The Daily Telegraph (published in his article of 31st January 2004). 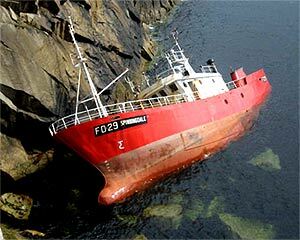 The lives of all four crewmen of the vivier potter KERLOCH (J235) were saved after their vessel sank shortly after hitting Crow Rock, off Pembrokeshire's Linney Head in the early evening darkness of 20th February 2010. They were en route from Lundy to Milford Haven at the time and took to their liferaft as the 17.2m vessel sank, being picked up by the DOLLY ANNE Neyland fishing vessel which had seen their distress flares and called the Coastguard. The weather and sea state at the time presented no problems, with a SW 10 knots breeze, but the sea was very cold at this time of the year. The new lifeboat based at Angle (the Tamar class Edward and Barbara Prigmore) had its first operational call-out, taking the crew from the DOLLY ANNE to Milford Haven for onward transportation to hospital in Haverfordwest as a precaution; they were uninjured and not suffering from hypothermia. 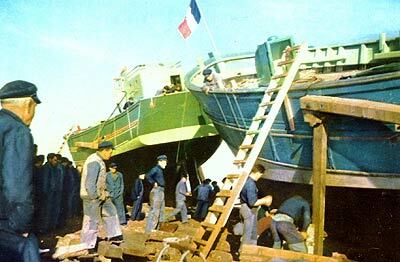 This photo of the vivier-potters KERLOCH (to the right) and INCONNU nearing completion in 1959 at the Camaret shipyard of Chantiers Albert Peron was kindly provided by Philippe Moudenner, whose uncle was the first owner of the INCONNU. Both vessels were later sold to British owners and were registered in Jersey when lost; both have sadly been wrecked in the Shipwrecks UK area. The INCONNU was lost on the 16th January 1996 when fire, leading to explosions, caused the vessel to drift into rocks on the west of Hoy, in the Orkneys. Tragically, the skipper - Paul Simpson - was killed as a result of the fire. The 40grt, 16.3m Teignmouth crabber ETOILE DES ONDES (WH696) was in collision with Malaysian Bulk Carriers' ALAM PINTAR. The 47,000grt (87,000dwt) bulk carrier was en route from Singapore to Hamburg when the ETOILE DES ONDES was run down in the English Channel about 20 miles north of Cherbourg. The ALAM PINTAR appeared to be unaware of the collision, which happened at about 8.30pm on 20th December 2009, but a spokesman for the owners later confirmed the vessel's involvement. The photograph, left, of the ETOILE DES ONDES was taken in September 2009 by John Eaton who kindly agreed its inclusion. A 21 year old member of the crew, Mr Chris Wadsworth, remained missing after a wide-range search was called off at 4.27am. The skipper and other two crew members took to their liferaft, from which they were picked up by the Norman Voyager, which had seen their distress flares and notified the French CROSS (Centre Regional Operationnel de Suveillance) HQ at Jobourg, near Cherbourg. The search included at least two helicopters and an aircraft, in addition to four commercial vessels. The skipper had to escape underwater from the cabin. The sea temperature was 9°C and the air temperature only 3°C. One of the French coastguard helicopters took the crew from the Norman Voyager to hospital in Cherbourg where they were immediately treated for hypothermia. Registered in Weymouth, the wood-hulled ETOILE DES ONDES (French for `Star of the Waves`) was built at the Rolland Shipyard in 1957. She was owned by the Simmonds brothers of Teignmouth, where all members of the crew were living. This photo of the ALAM PINTAR outbound from Hamburg on 24th December 2009 was taken by Jens Boldt who kindly provided agreement for its inclusion. Now attracting national media publicity because of its silver ingots, the SS GAIRSOPPA was typical of the tragedies that befell well over 500 vessels in the seas surrounding Britain and Ireland in 1941. The British India Steam Navigation Company’s GAIRSOPPA was sunk by U-101 some 200 miles south-west of Galway shortly after midnight on 17th February. She had been spotted by a 4-engined Focke-Wulf Condor in the morning of the previous day. Working in concert with u-boats and heavy cruisers, this long-range aircraft was instrumental in inflicting heavy losses on convoys such as SL-64. It was this convoy, en route from Freetown (Sierra Leone), from which the GAIRSOPPA became detached, needing to replenish her bunkers at Galway and left without the protection of convoy escorts. Three lifeboats were believed to have got away from the sinking ship after she was hit by a torpedo and burned fiercely, but only one of these delivered a survivor to safety – and he was the sole survivor from the GAIRSOPPA: the master, 81 crew members (including 70 from the Indian Merchant Navy) and two DEMS gunners were lost. In one of the more harrowing tales of life and death at sea, this lifeboat came ashore at Caerthillian Cove, just south of Kynance Cove and close to the tip of the Lizard (Cornwall) on 1st March, with only 3 Europeans and 2 Indians alive from the more than 30 that had boarded it on 17th February. Of these, only 2nd Officer Richard Ayres survived the final capsize in the surf of the cove, after the rudderless open lifeboat had travelled eastwards more than 300 miles. The GAIRSOPPA had started her final voyage in Calcutta. In addition to its cargo of pig iron, tea, and general cargo, she was reportedly carrying 3 million ounces of silver in the form of ingots. Presumably this was thought to be of most interest to salvors when a new policy of competitive tendering for the salvage of Government-owned wrecks and cargoes was introduced ; the GAIRSOPPA was the subject of the first such invitation to tender in the Autumn of 1989. Thought to lie at a depth of more than 6,000 feet its cargo may now be salvaged – if successfully located – by Odyssey Marine Exploration (associated with such shipwrecks as the 1641 Merchant Royal and 1744 HMS Victory). Odyssey were operating in the general area in November 2008 when, using their ROVs, they discovered the wrecks of the CAIRNHILL and LACONIA (carrying silver from the Americas), steamships that were sunk in 1917 off south-west Ireland. Odyssey made a claim for ownership, based on abandonment, but the UK's Transec / DfT counter-claimed as the vessels were covered by WW2 War Risks insurance and deemed to be the property of the Secretary of State for Transport. The AQUILA (BA 379) was seen to overturn and, despite a rapid response from the rescue services, 3 of her crew - including experienced skipper Tony Hayton, from Maryport - lost their lives. The other crew member and only survivor was rescued by the yacht ARRAN COMRADE, about an hour after the alarm was raised, and taken to hospital in Fort William following transfer to the RNLI Mallaig lifeboat. Helicopter response was provided by Stornoway Coastguard and the Prestwick flight of 771 Sqn NAS, HMS Gannet. An MAIB investigation will be held into the circumstances surrounding this tragedy; there was no initial indication of the cause. The sea-state was rough, in force 7 winds, but within the normal operating conditions for this type of vessel. Ship Type: Fishing vessel, m.v. The Dutch salvage specialists 'Multraship Salvage' has successfully salved a sinking dredger off the coast of Kent. The 67m long Van Oord owned dipper dredger GOLIATH has now been towed to the Moerdijk area of the Netherlands for diver inspection and repair if necessary. GOLIATH was under tow from the Netherlands to Ireland by the Sea Contractors Ltd. tug Sea Alfa when it began to take in water and sank off the Kent coast on Friday 9th May. Multraship was called in and advised the tug master to beach the dredger between Deal and Kingsdown in the Downs, inside of the Goodwin Sands to prevent the dredger sinking completely and possible pollution. Odyssey Marine Exploration have conclusively located and identified the wreckage of the Royal Navy First-Rate warship HMS VICTORY, sunk in 1744; this is a most important discovery. Many have searched for this vessel over the years. Reports now emerging indicate that the find was initially made in May 2008, after extensive surveys, more than 50 miles from the Casquets reef (north of the Channel Islands, where history has placed the loss of this vessel). The 'Black Swan' find, another Odyssey project which was announced in 2007, was initially understood to be the long-lost MERCHANT ROYAL, sunk off Lands End in 1641, but has seemed increasingly likely to be the 1804 wreck of the NUESTRA SENORA DE LAS MERCEDES Y LAS ANIMAS. There is more information on the MERCHANT ROYAL below. The 7365 ton multi-purpose cargo ship MV SINEGORSK, en route from Oskarshamn in Sweden to Alexandria, Egypt, shed some 1,500 tonnes of its timber cargo about 14 miles south of Beachey Head at just after 8am today. The Russian Federation vessel, 133m in length and built in Spain in 1991, is operated by the FESCO Transport Group. The voyage is an almost identical one to that of the ICE PRINCE, which sank in the early hours of 15th January 2008, but the vessel presumably did not list after the timber was spilled and has continued westwards towards the Solent where the situation will be reassessed. As with the ICE PRINCE, the floating timber is expected to present a significant navigation risk and warnings were quickly broadcast by the MCGA. ABIGAIL H :: [photo above by John Luxton / www.irishseashipping.com ]. Wyre Marine of Fleetwood's busy, 34m dredger, built by Yarwoods of Northwich, took on water and sank at her Heysham moorings on 2nd November. No-one was aboard. Her bow stayed afloat for a while but then she settled completely, with a list of 20°, her 3.5 tonnes of fuel oil presenting a challenge for anti-pollution containment. The Netherlands company Svitzer Salvage BV was contracted to raise and refloat her and this was achieved on 25th November, in co-operation with the owners, local authorities and the crew of the chartered floating crane "MERSEY MAMMOTH". SHAUN SHAUN :: This 17m Sligo-registered seine net trawler sank 3/4 mile south of Drumanoo Head, near Killybegs early on 4th November and her crew of 3 - the owner / skipper and his son and brother - were quickly rescued by the SHAUN SHAUN's sister vessel, RACHEL D, with whom she was pair-trawling for herring, after the vessel started taking in water. FAITHFUL FRIEND II :: [photo above by Alan Smillie / peterhead-fishing-harbour.blogspot.com ]. She sank two days after the loss of the SHAUN SHAUN. 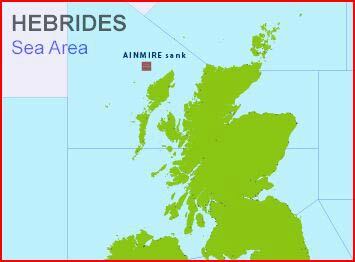 The crew of 3 were also recovered by another trawler, the SAPPHIRE, within 10 minutes of escaping to a liferaft after taking in water 5 mls SW of Bayble Island near Stornoway. The 18m, Fraserburgh-registered FAITHFUL FRIEND II was a wooden vessel, built in 1970; her home port was Stornoway. 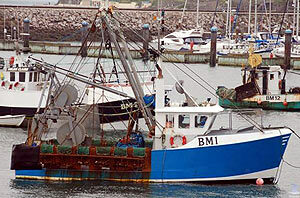 ALEYNA :: The plight of the 2 fishermen aboard this 14m steel trawler/ scallop dredger was serious when their nets snagged at about 8am on 26th November: they were underwater in cold water, 20 mls SW of Portland, following the sudden capsize of their vessel before escaping to the surface. The vessel was still floating upside down when the rescue services arrived and they were airlifted to Dorset County Hospital in Dorchester by the Portland Coastguard Rescue helicopter from the GIRL DEBORAH which had observed the capsize from a mile away, abandoned its own gear and rushed to the scene. The ALEYNA, registered in Jersey but previously registered in Newlyn (NN138), operated out of Brixham. 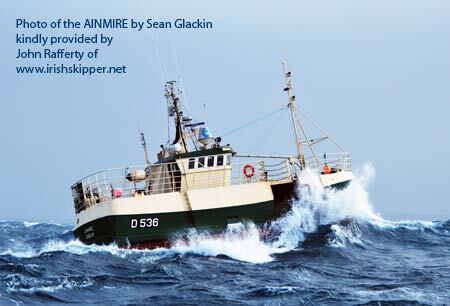 The photograph of the ALEYNA was kindly made available by matty b / trawlerphotos.co.uk. A further event in November was QE2's brief contact with the Brambles sandbank (between Calshot and Cowes - and the location for an annual cricket match!) on 11th November en route from the Mediterranean to her last call at Southampton before her Dubai decommissioning. The 70,327grt QE2 was stranded with 1,700 passengers and 1,000 crew aboard for less than an hour, from the first report at 5:26am, before she was re-floated with the aid of tugs and appeared to be unscathed. 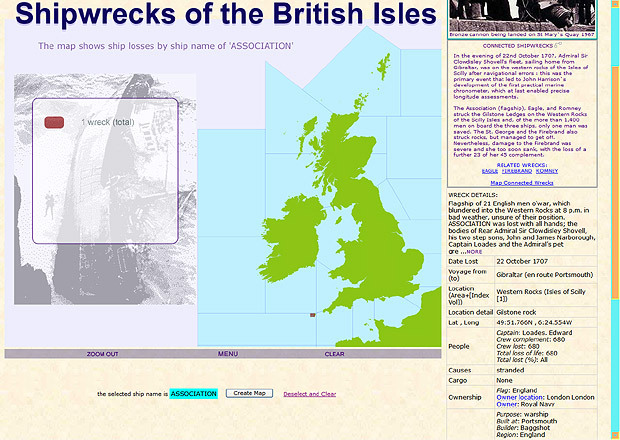 The map above provides a re-cap of the shipwrecks that have occurred in 2008, illustrating the never-ceasing losses from shipwrecks in the seas surrounding Britain and Ireland. Information about the wrecks listed is contained elsewhere in this page though we have much more full information within our Shipwrecks UK resource. Although this number is substantial and wide-ranging, you might like to compare the map above with our 'all wrecks' map or those on the more detailed screenshots page. If we have omitted any wrecks that have occurred to date in 2008 from the map or this page then we will be pleased to hear from you to enable us to correct the omission(s). All members of the crews of the GUYONA and the LEVAN MOR were safely recovered from life rafts by the rescue services after their fishing vessels capsized and alerts were raised following cessation of the vessels' regular safety signals. The 26 year old, 13m GUYONA sank on 24th June and the 20 year old, 11m LEVAN MOR on 23rd July. The 3 crew of the Brixham-based GUYONA were recovered by the St Peter Port lifeboat; the scallop dredger / stern trawler had sunk about 3 miles south of Little Sark in the Channel Islands. The 2 crew of the Looe-based LEVAN MOR were airlifted to safety about 14 mls south of Lands End by a RN rescue helicopter from Culdrose. 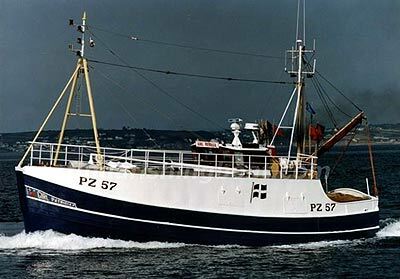 The photograph of the GUYONA was kindly made available by martin johns / trawlerphotos.co.uk. The GIRL PATRICIA (PZ 57) gill netter from Newlyn has foundered about 28 miles NW of Lands End at 50:19N 6:18W. All four crew - including skipper Shaun Williams, and his son Aron - were winched safely from the sea by RNAS Culdrose Rescue Helicopter 193 and taken to Royal Cornwall Hospital, Truro. The circumstances which led to the sinking of this nearly 40 years old wooden vessel are not yet clear, but the fish room was filling rapidly with water and the engine room awash before the vessel was abandoned. 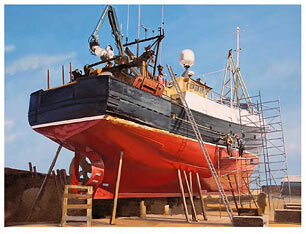 The GIRL PATRICIA was launched at the Porthleven Shipyard in 1969. She was 17.8m in length with a beam of 5.6m and draught of 2.68m. Permission for use of the above photograph of the GIRL PATRICIA was kindly provided by Mr Michael Williams. The storms that rolled in from the Atlantic in March 2008 resulted in an untypically small number of wrecked ships in the Shipwrecks UK area while causing havoc on land. The St Brieuc registered MARIE-LOUISE BERTHE sank 41 miles west of Guernsey on 10th March in winds of up to 110km/hr and the crew were rescued by other fishing vessels (the NOMINOE and the ECUME DES JOURS). Later in the month, the Dunbar lifeboat SIR RONALD PECHELL BT was driven onto rocks at Torness from her morrings, with terminal damage to the vessel. If anyone has details of other losses we would be grateful to hear from you. The above dramatic photographs of the SPINNINGDALE being pounded by the waves against the cliffs of Village Bay, St Kilda -- taken by Alister MacDonald who has kindly made these available to us -- show how the sea is in the process of possibly claiming another casualty, amazingly without loss of life. The crew raised the alarm at 05:20, after the vessel had run aground and was being swamped, and all 14 were rescued by a Coastguard S.92 helicopter from Stornoway. A Sea King from RAF Lossiemouth was also involved, as was the Stornoway lifeboat; the CELTIC SEA fishing vessel provided communications. Three crew members, including two with hypothermia, were treated in Stornoway's A&E but discharged later. 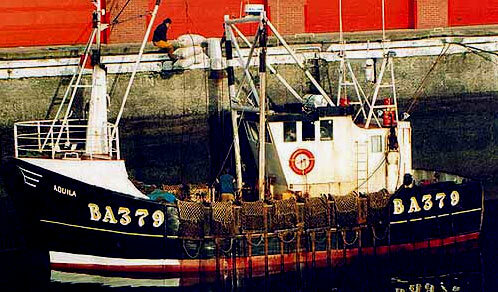 The SPINNINGDALE (FD29) was registered in Fleetwood but is Spanish owned, operating from Galicia, and crewed by 11 Spanish and 3 Portuguese fishermen. The 117-ton vessel was built in Aberdeen in 1968 but re-equipped as a deep sea longliner, with shelter deck and refrigerated hold, in the 1980s. 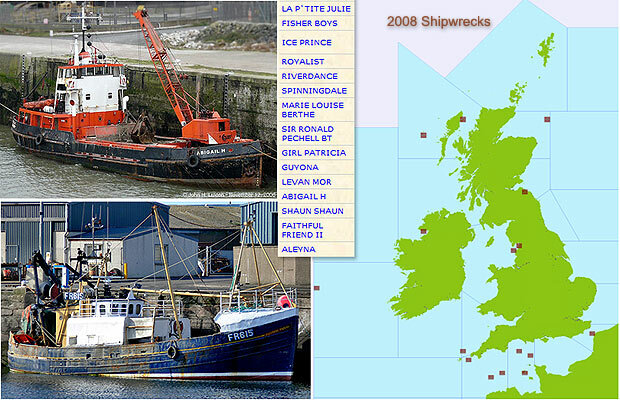 A week prior to the SPINNINGDALE wreck, another UK-registered Spanish-owned fishing vessel was lost. The 18 crew members of the ROYALIST were rescued from life rafts in the deep fishing area about 180mls west of Co. Clare, Ireland by the DAMAFRAN, a French trawler, and taken to Dingle, Co Kerry. The 228grt ROYALIST was built in Beverley in 1960 and rebuilt in Spain in 1987. 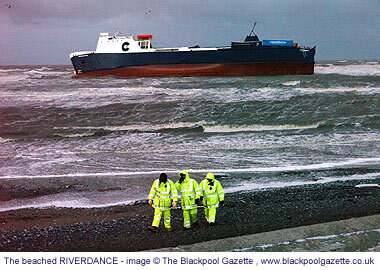 The Seatruck ferry RIVERDANCE ran aground on Anchorsholme beach, Cleveleys (just north of Blackpool) shortly before midnight on 31st January. A Mayday was broadcast at about 7:30pm after cargo shifted and the RIVERDANCE began to list. This reached 60° but was later eased to 35° while she continued to drift. A freak wave had hit the vessel while in the relatively shallow 'Shell Flat' sandbank area, known for difficult sea conditions, about 10 miles WSW of Fleetwood. Weather conditions across northern Britain were atrocious, with winds of at least storm force; waves were reported to be in excess of 7m at the incident site. The 6,041ton, 116m RIVERDANCE was travelling from Warrenpoint in Northern Ireland to Heysham, Lancs, a journey that the ferry normally undertakes each day. This ro-ro ferry carries up to 55 vehicles or trailers and 12 passengers. The four passengers were initially airlifted to safety while the 19 crew managed the situation in a manner that drew accolades from the rescue services in the treacherous conditions; it is understood that they were also attempting to restart the engines. Liverpool Coastguard coordinated the rescue and assistance was provided by: rescue helicopters from RAF Valley, RNAS Prestwick and Dublin Coastguard; RNLI lifeboats from Lytham and Fleetwood; offshore support vessels Clwyd Supporter and Highland Sprite; and the Steersman oil products tanker. Ten of the crew were also airlifted from the vessel before it grounded and the remaining nine were taken off later. There were no significant injuries. Attempts will be made to refloat the vessel when the weather improves, and tugs are standing by, but the outcome is uncertain. There are about 100 tonnes of bunker fuel oil and 50 tons of gas oil still on the vessel. Built in 1977 by Rickmers Werft - Bremerhaven - as the MASHALA, the RIVERDANCE (from 1996) has held 7 names. 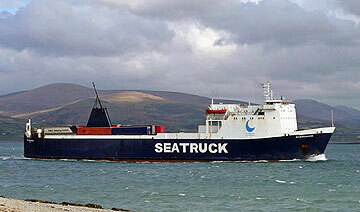 Registered in Nassau, Bahamas, her current owners are Seatruck Navigation. Permission to use their photographs of RIVERDANCE was kindly given by the Blackpool Gazette (top), who are continually updating their information - including video, and www.irishseashipping.com / J.H. Luxton. Action is continuing to get the RIVERDANCE back to an upright position in preparation for intended refloating. All oil has been safely removed from the vessel to prevent any risk of contamination. The RIVERDANCE has been declared a Constructive Total Loss by its owners and insurers after her position became ever more entrenched in the weeks following her stranding. The sinking of the ICE PRINCE in the early hours of 15th January 2008 was a dramatic process involving a particularly difficult rescue and the spilling of most of her deck cargo during the course of the 54 hours following her Mayday call at 19:00 on 13th January. At this time she was about 35 miles SE of Start Point (at 49:52.5N 003:12.7W) and rolling heavily, with neither main engine nor auxiliary power. The crew of 20 -- of Greek, Filipino, Romanian and Lithuanian nationality -- were taken off just before midnight on Sunday, 13th January after her cargo shifted and she began to list 40° to port. The ship was plunged into darkness. Twelve of the crew, including one reported to have a broken leg were taken off by the Portland-based Coastguard SAR Sikorsky helicopter `India Juliet`. The remaining 8 were taken off by RNLI lifeboats from Torbay and Salcombe, in an operation that took place with the 2 vessels alongside in force 8 winds and 5m swells. RN frigate HMS Cumberland offered assistance and the tugs Abeille Liberte and Anglian Earl stood by. A plan to take the vessel in tow was abandoned as the weather worsened and conditions prevented Dutch salvage experts, who had been flown to the ICE PRINCE by helicopter, from being landed. The ICE PRINCE sank at 12:45am, 26 miles SSE of Portland Bill after the list increased still further and she capsized. She was carrying 313 tonnes of fuel oil. The bow initially remained above the water, with the stern on the seabed (at about 55m depth), but this situation lasted only a few hours before she sank fully. The cargo of 5,258 tons of sawn timber was en route from Sweden (Iggesund and Umea) to Egypt (Alexandria). Two-fifths of this was deck cargo, much of which has been distributed over a wide area of the central and western English channel and is being mapped by the MCGA. It has formed a `slick` of 10m planks, and the bundles are breaking up. 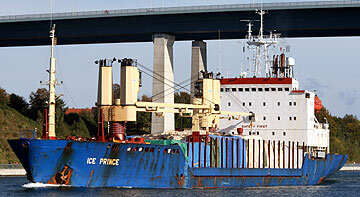 The ICE PRINCE experienced a similar shift of her timber deck cargo in the Baltic on 22nd January 2004, resulting in a 30° list on that occasion before the situation was stabilised. Timber is regarded as a difficult deck cargo in this respect as a result of changes when it becomes wet, progressively escalating the problem. The photographs were kindly provided by Ralf Bandholz (above) and Klaus Masuch (below). 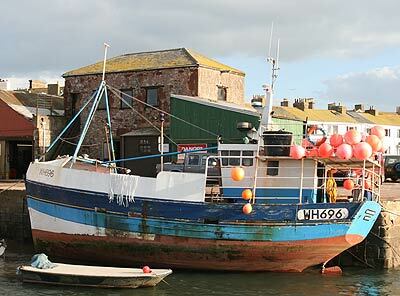 The FISHER BOYS fishing vessel from Gardenstown, Banff, sank at 11:08 on 11th January 2008 about 40 miles from Fraserburgh after the vessel began to take on water. All 5 crew had been transferred to a support vessel before the sinking; 2 had stayed on board with pumping equipment until it was clear that there was no hope of saving the vessel. A French fishing vessel appears to have foundered in heavy seas, with loss of life, between Cornwall and Britanny during the early hours of 7th January 2008. Reports suggest that she sank in only 5 minutes. The LA P'TITE JULIE sank 50 miles SSE of the Lizard and 34 miles north of île Vierge at about 49:10.6N, 04:30W. Conditions were severe, with winds of gale force 9 gale and swells of up to 5 metres. One of the 7 man crew -- David Dourado-Marques -- was found and airlifted to safety, suffering from hypothermia and shock, after prolonged immersion (he had reportedly been clinging to a buoy for 3 hours). The search and rescue operation, coordinated by CROSS at Plouarzel, Brittany, involved aircraft and helicopters from France and the UK (including 2 Sea Kings from RNAS Culdrose) as well as commercial and naval vessels. The search area covered more than 20 square miles. The searchers found 2 empty liferafts and wreckage and, regrettably, two bodies. The French investigation will include examination of the hull, at about 80m depth, and will look for signs of possible collision. The 334 metre Lloyd Triestino Cortesia became stranded on the Varne Bank, about 9 miles south of Dover, about an hour prior to the 6am high water on 2nd January. She was en route from Thames Port (London) to Suez, with a crew of 27; none were injured by the stranding and the vessel appeared to have remained watertight even after the critical low water that would have imposed major stresses. Equipped to carry more than 8,000 TEUs (twenty-foot equivalent container units) her total deadweight is about 100,000 tons, including a cargo of nearly 43,000 tons, and her draught is 14.5m. In June 2005 she was the largest vessel to enter Thames Port. She was built by Samsung Shipbuilding and Heavy industries of South Korea and completed in 2005. The operators of the vessel, Lloyd Triestino, are part of the Taipei (Taiwan) based Evergreen Marine Corporation. 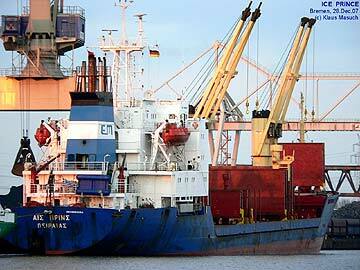 The vessel's port of registry is Hamburg, Germany. Two or three vessels of more than 10,000 TEU capacity pass through the Dover Straits each week. The 397 metres / 160,000 GRT Emma Maersk, then the world's largest container ship with a declared capacity of 11,000 TEU, docked at the Port of Felixstowe in November 2006. LT Cortesia and her cargo were saved but the Isles of Scilly have recently had recent experience of containers being washed ashore from a mystery vessel, albeit on a rather smaller scale than the CITA shipwreck of March 1997 (or NAPOLI wreck of January 2007). Thanks to some detective work, the mystery has been solved but these events help to illustrate container ship trends. Situated 24 miles off Land's End where tidal currents from the Atlantic, Bay of Biscay, English, Bristol and St. George's Channels converge, a variety of natural and man made items frequently end up thrown ashore by storm or tide on the beaches of Scilly. On 31 December, islander David McBride, a dive-boat owner and underwater photographer, was walking his dog on Porthloo beach, St. Mary's, when his attention was drawn to dozens of clear pvc containers within which were medical 'drip bags'. He rang Richard Larn, local maritime historian and author (and Chairman of Shipwrecks UK), suggesting he should investigate the finds. The bags proved to be medical supplies manufactured by Baxters Healthcare International Ltd, of Castlebar, Ireland, They were 2,500ml Glucose Physioneal 35, 1.36% drips, each complete with the necessary tubing, and smaller 100ml containers of Viaflo Cloruro Sodico, 0.9%, which appear to be saline drip bags. Contact was then made with Baxters head offices at Thetford, Suffolk, where Michael Gavin, the Operations Manager, admitted this was the first knowledge they had received that some of their products were floating around the Western Approaches. After being given the batch and bar code numbers by Larn, they initiated an enquiry with Ireland. This revealed that the drip bags were a consignment loaded into containers at Castlebar, shipped to Dublin and loaded on the mv ENDEAVOR for Bilbao, Spain. A 7,642-tonnes gross motor ship, built by Daewoo at Mangalia (Romania) in 2005, and registered at Harlingen, Netherlands, she was owned by Endeavor Shipping who operated the new DFDS Suardiaz Line. This company was formed in March 2006, when DFDS Lys Line AS of Norway and Vapores Suardiaz Norte SL of Bilbao amalgamated, to start a new short-sea weekly shipping service between Spain, the UK and Ireland. The ENDEAVOR left Dublin on 10 December last, but when some 40 miles north of the Seven Stones reef, still in St.George's Channel, met with hurricane force winds and very heavy seas, which caused the ENDEAVOR to roll heavily and take huge seas over her foredeck. At midnight, according to her deck log, she was at lat. 50:34.3N, long.06:09.9W steering south; by daybreak she had reached 48:46N, 06:08.3W, some 45 miles off Ushant, where her crew discovered they had lost 11 containers overnight, somewhere on that 110 mile track, and are known to have held 24 pallet loads of raw tobacco, milk powder, wooden doors, scaffolding, non-toxic fibre and the Baxter pharmaceutical products. The same drip bags were also reported as coming ashore at Sennen Cove and in Mount's Bay, as were boxed refrigerators, but these are still something of a mystery. The potential for container losses is huge. Lloyd's estimated worldwide container underway losses to have reached 10,000 -- per year -- in 2004. Lost container claims increased by 447% for the eight years to 2000, and the average of each claim was then around $400,000. The Malaccamax standard that is envisaged (and which would just be able to clear the 25m minimum depth of the Straits of Malacca) would load ships with a total length of 68 miles of containers (18,000 TEUs). Ellen MacArthur's `Kingfisher` struck a semi-submerged container during the closing stages of the Vendee Globe solo race in January 2001 and many other yachts have had similar impacts, but there are no reports of shipwrecks that have -- yet -- been caused by collision with containers. The FLYING PHANTOM tug capsized in the Clyde at about 6pm on 19th December, in dense freezing fog. The FLYING PHANTOM was one of three Svitzer tugs which had been towing the 39,000 tonne Panamanian bulk carrier RED JASMINE. Radio contact with the tug was lost and no mayday message was sent. The bulk carrier docked safely, at the King George V dock. The accident happened near the mouth of the River Cart, opposite the massive Titan crane of the former John Brown shipyard. One of the four crew members managed to swim from the vessel after the capsize and was rescued as a result of very prompt action by a local workboat operator. Intensive searching involved all the rescue agencies and more than 60 people, including police divers operating in very difficult conditions. Sadly there were no other survivors and the bodies of the other three, including skipper Stephen Humphreys, were later recovered. The FLYING PHANTOM is owned by Svitzer Marine Ltd, a subsidiary of SvitzerWijsmuller A/S of Denmark. 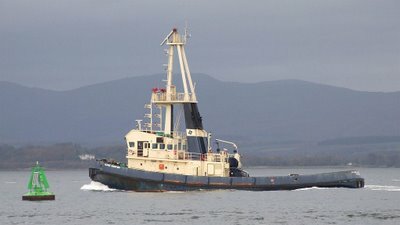 A 347 GRT vessel, she was built in 1981 by Ferguson Shipbuilders, Port Glasgow and was well-equipped for towing and firefighting. She was the last Clyde-built tug to be operating locally. Accounts suggest that the tug capsized after striking a sandbank while engaged in the tow and that there was no impact with the RED JASMINE, one of the largest vessels to proceed this far up the Clyde for more than a decade. The FLYING PHANTOM, which was maintained to very high standards, had been involved in a collision nearly seven years earlier, on 29th December 2000, with the Egyptian ship ABU EGILA which she was also towing to Glasgow's King George V dock. The tug was for a while aground, very close to the 2007 capsize position, after taking in water. The last incident involving the sinking of a tug and fatalities as a result of a towing accident was on 23rd May 1962 when the FORAGER was pulled over by the towline while she was helping the HORORATA to dock in Glasgow and two crew members died. The above image of the FLYING PHANTOM was kindly provided by John Newth of ClydeSights. After lifting by the 400 tonne floating crane GPS ATLAS, the FLYING PHANTOM was pumped out and towed to the King George V Dock in Glasgow on the evening of 22nd Janauary 2008. See a dramatic photo of the lift on John Newth's ClydeSights. The recent announcement that up to 7,000 new wind turbines could be erected around the UK coast by 2020 has significant implications for shipwrecks. One important consideration is nautical archaeology. The Government will wish to ensure that offshore wind farm sites are chosen which do not compromise our heritage, and shipwreck analysis will form an important part of the Environmental Impact Assessments. Detailed surveys will yield important new information, building on available knowledge. There are many other reasons why shipwrecks must be fully considered, including the recognition that most are also associated with tragedy. Concerns have been expressed that the turbines can pose a risk to shipping and could eventually cause new wrecks. A special one-day meeting of the House of Commons Transport Committee in April 2004 heard evidence regarding risks to commercial ships and their crews. The impact of wind turbines on ships' radar and communications is being studied to assess the extent to which this could contribute to collision risk. Collisions have been one of the major causes of shipwrecks, with more than 4,300 vessels lost from this cause alone in the seas surrounding Britain and Ireland; the JORK (see below) provides one example from 4th August 2007. Shipwrecks UK Ltd stands ready to provide information for the EIAs, initial assessments and other related enquiries. Information to support sensitivity of sites, context and details of individual ships is available immediately. 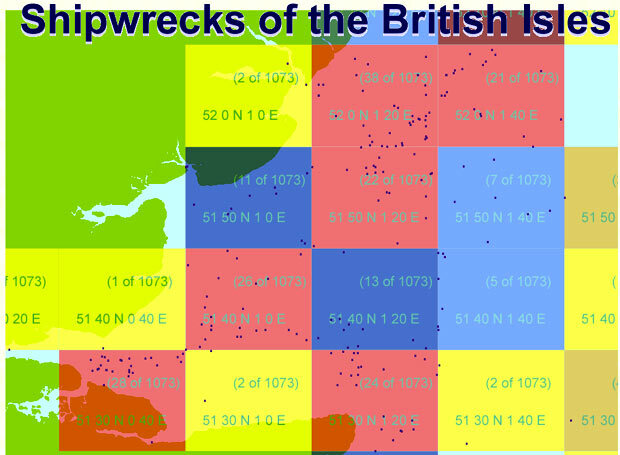 We can also show causes and densities of shipwrecks anywhere within the Shipwrecks UK area. The Shipwrecks UK resource is already a major asset in rapidly highlighting the significance of potential sites. The map below shows a few of the ships sunk from just one cause - mines - and in just one area: the Thames Estuary. A small but chilling reminder of the wartime toll of seamen in the seas around Britain and Ireland. In an area less than 100 by 40 miles, sea mines accounted for more than 200 ship losses. In the seas around Britain and Ireland as a whole, ship losses from mines totalled nearly 1,100 - from more than 20 countries - and with the loss of more than 5,000 lives. These important events and their significance for the development of the first practical marine chronometer by John Harrison were commemorated in the Isles of Scilly and elsewhere (including Westminster Abbey). Dr Simon Harris, author of 'Sir Cloudesely Shovell, Stuart Admiral'. Click on the images of any of the five speakers (above) to see more photographs by Shipwrecks UK taken during the Isles of Scilly commemorations (including some of more general appeal). Sir Arnold Wolfendale and Dava Sobel also kindly provided Reviewers' Comments after they had seen the Shipwrecks UK resource in action. 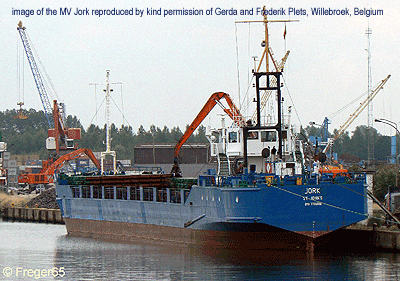 The general cargo vessel MV JORK struck the ConocoPhillips Viking Echo gas platform on Saturday, 4th August and sank the following day. The platform, which was unmanned, suffered very slight damage. There is a 500 metre exclusion zone around such rigs. The incident took place 40 miles north-east of Cromer, Norfolk. As a result of the impact, and resulting 30 degree list, water was able to reach the cargo of grain which swelled and burst the hull. The six Polish crew members, wearing lifejackets, jumped into the sea and were recovered by the Putford Puffin, one of two standby vessels which steamed to the scene. The Polish Captain continued efforts to save the ship before also abandoning ship when it began to sink. He later appeared before Boston Magistrates Court on a charge of being drunk in charge of a sea vessel under Section 78 of the Railway and Transport Safety Act of 2004. A rescue helicopter from B Flight, 22 Squadron at RAF Wattisham was also scrambled to assist. The crew members of the Jork were later assisted by the Mission to Seafarers in Great Yarmouth. The wreck lies at a depth of about 25m, approximately 500 metres from the Viking Echo platform. The MV Jork was built at the same shipbuilding yard (J J Sietas in Hamburg-Neuenfelde) as the MV Cita which sank ten years ago (as mentioned in the 'Anniversaries' 23rd July 2007 News Item below). 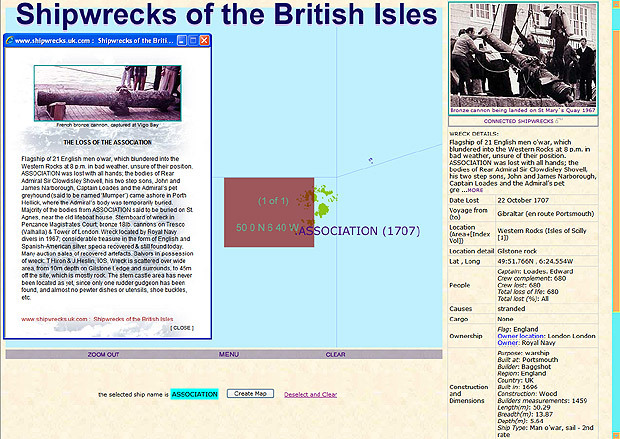 A further four ships from this shipbuilder are wrecked within the sea areas covered by the Shipwrecks UK System. This year the Isles of Scilly commemorate five shipwreck anniversaries. This small group of islands stuck out in the Atlantic, 24 miles due west of Land's End, is notorious for shipwrecks, having witnessed over 900 named losses and countless others which went unrecorded, lost at night or in fog. Sir Clowdisley Shovell and his flagship Association, along with three other Royal Navy men o'war and at least 1,450 men, were lost 300 years ago on 22nd October 1707. 2007 is also the 40th anniversary of the relocation of three of those ships by Royal Navy divers on 4th July 1967; the wreck site of the 4th of these ships, HMS Romney, has not yet been positively identified. Further information about the Tercentenary commemorations, taking place in the Isles of Scilly between July and October this year, can be reviewed by clicking HERE. The next oldest wreck commemoration is the Thomas W. Lawson, the worlds largest and only seven-masted schooner, lost on 14th December 1907, 100 years ago this year. On passage from Philadelphia to London on its first transatlantic crossing, carrying 2¼ million gallons of light oil, she passed the Bishop Rock light on the wrong side, found herself in Broad Sound, and was wrecked on Minmanueth Rocks, near the island of Annet, where she capsized. Fifteen of her eighteen-man crew drowned, along with Billy Hicks, a local pilot. Ironically, the Thomas W. Lawson which could be labelled the first 'tanker' oil spill in this country, was only upstaged by the wreck of the super-tanker Torrey Canyon, on 18th March 1967, 40 years ago. On her way from the Persian Gulf to Milford Haven carrying 120,000-tons of crude oil - of which 20 to 25,000-tons were released into the open sea around the Seven Stones reef. She struck the reef's Pollard Rock, only seven miles from the Isles of Scilly. From the outset it was obvious this was an unprecedented international disaster and the first major oil spill in Europe, so there was no experience on how best to deal with it. She broke in two on 26th April causing the release of even more oil, and Government took the decision to set her on fire. After Trinity House towed the Seven Stones lightship well clear, eight Royal Navy Buccaneer aircraft dropped 40 armour piercing bombs on her, of which only 30 actually hit the wreck. Twenty-six RAF Hunter aircraft followed dropping 5,400 gallons of kerosene to fuel the fires started, then 3,000 gallons of napalm and 16 HE rockets. A total of 161 - 1,000 pound bombs blasted the ship, burning the remaining oil she held, but the cost financially and ecologically was disastrous. There was a great sigh of relief from the residents of the tiny south Devon coastal village of Branscombe on Monday 9th July 2007, when it was announced that the salvors of this 62,000-tonne container ship would start pumping her out that night, and hoped to have her afloat within 24 hours. Later that day the ship was able to be towed into deeper water where, after anchoring, it could be inspected by divers. It had been estimated that her hull contained 58,000-tonnes of water, and 37 special pumps worked constantly to get her afloat. It was also an important step in removing the threat to the marine environment, since there were fears she might be so badly damaged that she became a total wreck. This would have delighted sport divers, but left the Maritime & Coastguard Agency (MCA) with a serious navigational hazard, since she was awash only to her upper deck. What will happen to her now has yet to be decided; either she will be towed to a dockyard and scrapped, taken way out into the Atlantic and sunk in deep water - as have many other wrecks before, or sunk in a suitable location, if such a place can be found, as an artificial reef attracting fish, marine life and divers. 19th January 2007 - During a Channel gale when south of the Lizard, all 26 crew were air-lifted off by SAR helicopters when cracks appeared in the ship's hull and it was feared she would sink. 20th January - Under tow of tugs the Napoli was deliberately run aground in Branscombe Bay, south Devon. It was feared that she would break up if towed to the more exposed but more immediately accessible north coast of France. Of the 2,315 cargo containers she carried, 103 washed off into the sea, 47 going ashore on the beach at Branscombe. 21st January - A frenzy of 'looting' commenced, as BMW motorcycles, nappies, sun tan lotion and general cargo washed out of containers, resembling scenes from Scotland's 'Whisky Galore'. 22nd January - A five-mile long oil slick developed offshore as some of her 3,500-tonnes of fuel oil leaked from her tanks. Sea birds were seriously affected, hundreds appeared covered in oil. A pumping operation commenced to remove the fuel on board which was successful. 28th January - A Dutch salvage company moored 'Big Foot', a massive salvage barge and crane, alongside. Unloading of deck containers began and these were transported to Portland, Dorset. Initially it took five days to unload 80 containers. 4th February - Last of the remaining oil on board pumped out. 15th February - Still only 342 containers lifted off, due to bad weather. Call for all recovered items to be declared to the Receiver of Wreck, with a fine up to £2,500 for failing to do so. 28th February - 1,000 birds released into the wild after treatment to remove oil. 7th March - Police seize two BMW motorcycles found near Axminster, 17 bikes having been taken from containers washed ashore, only 13 of which were declared to the Receiver. 9th May - Dozens of bottles of vodka stolen from a container held in store at Portland. People warned not to drink it since it might be contaminated by hazardous chemicals in the cargo, but people drank it anyway! 17th May - Last container from the main hold of the Napoli recovered. 24th May - A lady from Sweden, Mrs Anita Bokdal, who saw her personal household effects and belongings being looted from Branscombe beach on television news, made an appeal for her belongings to be returned. Some 2% were, but the majority were retained by the unofficial salvors. The hot news is that of Odyssey Marine Exploration's recovery of an enormously valuable cargo of coins, worked gold, jewels and other artefacts from a shipwreck that was strongly rumoured to be the long-sought Merchant Royal. In late September 1641, during the reign of Charles 1, the proceedings of Parliament were interrupted by the Secretary of State with an announcement that was both unusual and unprecedented, concerning a seemingly mundane shipwreck. But this was no ordinary wreck. The only printed document recording this unusual occurrence, which survives in the British Library, says it all: its heading reads 'Sad News from the Sea'. What made this particular vessel so attractive was her cargo which, in that obscure Parliamentary paper, was stated to be, '£300,000 in silver, £100,000 in gold and as much again in jewel(s)', and this was a valuation of 1641, three hundred and sixty six years ago. That amount of base metal which would be carried in the form of specie (coins) and bullion (bars) would today alone be worth many millions, leaving aside the gem stones described as 'jewel', ie: diamonds, emeralds, turquoise, rubies, jade etc. A practical yardstick to estimate the current value of historic money is to relate it to the cost of a pint of beer. In 1641 beer was roughly 1 penny a pint, and 240 pence = £1. Today a pint costs roughly £2.50 or 250p, which makes the silver carried worth £300,000 x 250 = £75m, the £100,000 in gold £25m, or £100m in total, plus the value of the jewel(s). So when Greg Stemm, Director and Project Manager of Odyssey Marine Exploration of Tampa, Florida, who located and salvaged the treasure, estimated the worth of the 17 tonnes of salvaged material to be £250m, the reality of the find becomes clear. In addition to treasure considerations, the ship was armed with 36 bronze cannon, which with this degree of provenance would be worth around £25,000 each, adding a further £1m to the total. The estimates do not take into account the additional numismatic, archaeological and historic value of the coins, bars and artefacts recovered. Some details of the loss of the Merchant Royal are obscure but what is known is that she was a Dartmouth-registered ship, under Captain John Timbry, which happened to be in the Azores in 1641 when a Spanish 'Plate Fleet' treasure ship from the Americas came in on fire. The fire was extinguished and the treasure transferred to the Merchant Royal, but at this point the background is unclear, since one source says she was to land the cargo at Amsterdam, another says Dartmouth, whilst a third says she called in at Dunkirk due to bad weather. Spain no longer controlled the Netherlands, so trade with Amsterdam was a possibility, whilst Dartmouth was the ship's home port. As far as we know, history does not reveal whether the treasure was now under the control of Spanish or English masters and this will be highly significant when it comes to the question of ownership of the cargo today. The Merchant Royal was blown by gales down Channel where, leaking badly, she was abandoned 'ten leagues from Land's End' (ie. roughly 30 miles). Her 80 crew and passengers were transferred to another vessel in company, only two sailors being lost: these had gone below to loot some treasure and went down in the wreck. 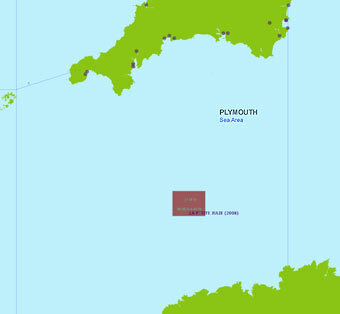 Odyssey Marine Exploration, operating two vessels out of Falmouth, have been searching Mount's Bay and the Western Approaches to the Channel for two years, locating thousands of potential targets which were categorised as modern iron or steel ships, rocks and reefs or simply interesting 'lumps' on the seabed. The latter were then systematically examined by ROV which led to this fantastic discovery, believed to lie some 40 miles SW of Land's End, in 330ft (100m) depth, 22 miles S of the Isles of Scilly. Importantly, the location is in international waters, allowing the salvors to take their recoveries straight to the USA. How much of the treasure Odyssey and its shareholders will be able to retain depends on whether Spain or Britain claim it as their property. It is looking increasingly likely that Odyssey's finds are not from the 1641 loss of the MERCHANT ROYAL but from the 1804 loss of the NUESTRA SENORA DE LAS MERCEDES Y LAS ANIMAS, a 36-gun Spanish frigate sunk off the Portuguese coast en route from Montevideo to Cadiz. This would also help to explain the apparent presence of milled edges on recovered coins. The MERCHANT ROYAL is probably yet to be discovered.